Once again I am inspired to write by the weekend going ons. First of all, while I recognize that imperialism is generally very bad and that many people suffered from it, as they say every cloud has a silver lining and I find my self grateful to the British for two things. First of all English is the language to speak. Even in an out of the way place like Dhiban many people have a smattering of English which combined with my very small bit of Arabic (perhaps 20 words and phrases) we manage to establish a rapport. It is exhausting, but well worth the effort to try to communicate. The second thing I’m grateful for is that you can find Galaxy bars in almost any former British colony. (The US is an obvious exception to this rule and suffers for it I believe; our average chocolate bar is clearly inferior.) And now that I’m thinking about it, I find myself grateful to the British for another thing, when the former colonies gained independence the right side of the road was chosen to be the correct side to drive upon. (Actually I’m not sure if this is attributable to rejection of British rule but for the purposes of this blog I’ll say that it is.) Driving in Jordan would be much more harrowing if I had to remember to drive on the left in addition to watching for goats, tractors, other vehicles, pedestrians, random cinderblocks, construction, etc. Speaking of construction, I neglected to mention this in my earlier commentary on Jordanian driving, but construction does not block the roads here. One simply shares the road, in whatever state of completion it is in with the construction equipment. It has been suggested by one of the team members that Jordanian Driving would be a great video game. On a more serious note I want to comment on the environment. This weekend in addition to visiting some of the Desert Castles we visited the Azraq Oasis, which once upon a time (ie up until the 1960s) was a huge wetland supporting many now endangered species. Unfortunately, much of the water has been pumped out to supply the cities of Jordan and now only about 10% of the wetlands remain. The 10% which remains is supported by government donations of 1.5 million liters (I’m not sure on the units there). To see the lush green grass, the fish and the birds in the middle of an incredibly arid area was so wonderful, not to mention also the role such areas play in water purification and oxygen production, but how long will the government be able to support even 10% with a growing population, refuges and new projects like luxury hotels which steal water like sponges to also deal with. Most of the springs were dead indicating that the aquifer beneath them is dry. It takes eons to fill an aquifer and so like many of the resources we rely on, aquifers can be considered non-renewable, at least not in this lifetime. This leads me to reflect on how my lifestyle conflicts with the health of the planet. Eating meat and imported fruits requires much more water and energy resources than locally produced foods and a vegetarian diet. And yet I still love my bananas and steak even though I know the damage their production causes the world. I’m not planning on going cold turkey on these things, but in the future I will be more mindful of the true cost of my food. But then I wonder about the cost of not purchasing that banana. Hypothetically, if all of America stopped eating bananas because banana plantains were replacing the rainforest and so much energy was expended in transporting them what would the effect on the countries who grow bananas be? Would their economies be seriously damaged, would ordinary people suffer? Clearly there is much to investigate here and I obviously don’t have very many answers, but I put this before you in the hopes that with many minds on the subject progress may be made. And now for something completely different. Several weeks ago I mentioned that the girls of the dig were invited to a wedding celebration and promised to write about it. I’m sorry for the delay but here it is now, if a bit delayed. So as far as I understand, Jordanian weddings are made up of several different parts. I don’t know what the other parts are so I will not try to explain them all, just the bit I saw. Anyway, the bride was a sister-in-law of our dig liaison, Firas. (I’m not sure if that is his official title, but it does describe what his role is.) We attended the female only part of the celebration where all the women of both sides of the family gather in the house of the bride’s family. Because they are indoors in their own home the bride and her other female relatives can wear what ever they like. The brides typically wear something akin to a very elaborate prom dress with lace, crystals, beads sequins etc. And have their hair done in a very elaborate style. She then sites on a high throne like love seat while all the other relatives gather in the largest room of the house and visit and dance. Mostly it is the unmarried girls who did the dancing but some of the younger married women danced as well. The room was very crowded and hot but everyone seemed to enjoy the experience. At one point some women came in and sang accompanied by one woman playing a hand drum. The song and u-u-la-tion (sorry about the phonetic spelling of that one) were quite strange to western ears and I have no idea how to replicate the sounds but it was quite exciting and fun to see everyone get into the singing and clapping. Ah the time once again brings my writing to a close. I apologize for the truncated description but the pottery calls. Until next time. So this past weekend we had our big three-day adventure. On Thursday, we spent the night at a nature reserve in Wadi Dana, where I hiked the trail to the old caves. They were precariously close to the cliff’s edge, but still fun to explore. The sunset over the hills was absolutely breathtaking and I’ve never seen so many stars in the sky (we could even see the milky way from the campsite). On Friday, we drove on to Petra, which I knew only from what I’d seen of it in Indiana Jones. OK, that’s not really true—Jeff spoke about it quite a bit during his lecture last week on the Nabateans. In fact, it was really neat to go there and be able to connect the architecture we were seeing to the culture responsible for it. Wait…the sounds a lot like what we’re trying to do here in Dhiban. Wow, it’s almost like archaeology is a useful, enriching, and exciting field. Who knew? As the excavation moves into its last three weeks, most of the team members are feeling more confident, now very familiar with the daily schedule and day-to-day life up on the Tel. And then there are a few of us down in the Wadi Dhiban, dodging wadi dogs and goats in an effort to get a look at the sediments at the bottom of the hill. A wadi is a seasonal river valley, generally dry during the summer and subject to flash floods during the rainy season – most are fairly deeply incised and the larger ones in Jordan approach Grand Canyon proportions. Although a wadi is not a particularly good place to find intact archaeological features, it’s a great place to look for evidence of erosion, and the Wadi Dhiban also preserves a number of architectural features that we’d like to understand more fully. The rock walls may have been agricultural terraces or they may have been built in an effort to stabilize the hillside; finding out what lies behind and beneath the rocks is the first step toward understanding their construction and purpose. A few dedicated and long-suffering workmen have been wielding picks and shovels for several days, and we’ll soon be drawing, describing and sampling the sediment they reveal. Other geologic efforts have also been going forward at Dhiban this year as well, as we try to incorporate a more specific environmental aspect to the research agenda. A few students have been lucky enough to end up as “geology assistants” as we’ve explored some of the local wadi systems in search of sedimentary records, mapped the local bedrock beneath the Tel, and done some preliminary mapping. And even if they didn’t appreciate the repetitive limestone and chert layers in our area, they got a taste of more exciting geology while exploring the fabulous sandstone at Petra this past weekend! The geologic investigations here are brand new, but we’re already excited about the initial data and we’re hoping to pursue more extensive regional investigations next season. In the meantime, if you’re looking for some geology at Dhiban, head up to the main excavation and then turn left. Head west over the hill, and try not to fall as you navigate the scree slope. Don’t worry if you don’t see us right away – there’s a fairly large cliff that you’ll have to get around, and then another steep slope. You’ll find us eventually – and if you get lost, the barking of the wadi dogs as they protest our presence will probably help you find your way. See you in the wadi! As previously mentioned, I have been spending these last few weeks excavating a Mamluk-era barrel vault here at Tell Dhiban. This has meant several weeks of lifting guffaws full of dirt and rocks up out of the building to remove the collapse while documenting brief re-occupations of the building. Finally, on Wednesday, I came down to a nice dirt layer that the collapse respected, meaning that it fell mostly on top of the floor, with a few heavier ashlars more embedded in the softer ground. At first I was afraid that I might have missed the floor—we were expecting flagstones—and had moved on an earlier construction phase by accident. But as we were coming down to the surface we had fewer finds, and the dirt was pretty “clean.” For a tell just lousy with occupation it would have been difficult to get a construction fill that didn’t have loads of artifacts embedded in the matrix. I also didn’t see much of what could have been flagstones—it was all rubble from the collapsed ceiling and floors. We’ll see how accurate my interpretation is when we get more of the building cleared out! The dirt floor also respected the bin in the south wall, which ended up diving down much farther than I expected. As I was excavating the last of the collapse back, I noticed that it also respected a line of ashlars effectively bisecting the building right at the cistern. We have a similar construction pattern in the west half of the building and whether this is some kind of water management system from the cistern or delineated activity areas, I’m not sure. I am currently leaning against the idea that it was a water system linked with the cistern because it appears that the cistern access was blocked off at this phase by a rebuilt wall. Again, this remains to be seen as we clear more of the collapse out. From what I’ve seen, the phasing of this building (which I’ve jokingly called the “Mamluk Emporium—everything MUST GO!”) is a bit complicated—it was originally built with two doors, one into another room to the north and another out to a courtyard to the west. Then the north wall was cut away and a cistern was installed between the two rooms. Then, for whatever reason, the cistern was blocked off, but a niche was left where the door once was. It’s these kinds of puzzles that make excavation so exciting for me—figuring out the architecture, revising my phasing narratives, finding things that completely turn your interpretations around. Not to mention other odd things like there being such an overabundance of Roman, Byzantine, and Iron Age pottery, with a relative paucity of Mamluk artifacts. The Mamluk were re-using stones from other buildings—a fact that makes reconstruction difficult (let’s use a Byzantine column base for a niche corner!) and excavation a bit of a headache. We’re also very near the acropolis of the tell, so wash can only explain so much intrusion from earlier artifacts. There are a lot of things that happen after the excavation ends—Alan will be running his float samples, there will be other artifact analyses, and a mountain of paperwork—but making sure that the archaeology is properly excavated in the first place is what gives the rest of our work meaning. 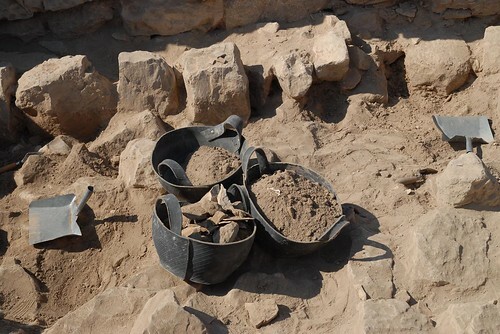 While this seems obvious, I don’t think that enough of an emphasis is given to the craft of excavation and there is certainly not enough training for archaeology students who want to go on in the field. Like many other archaeologists, my day is largely structured around the flow of the team work schedule. My name is Alan, and I am the team “environmental archaeologist”. As members of the team, each of us has distinct but complementary roles to play in excavation, processing, and analysis. As I am involved in environmental archaeological research, I am interested in understanding the physical and cognitive aspects of how people have managed their lives in their immediate surroundings throughout time. In the modern world we have become increasingly aware of our own impact on the environment, and my research here at Dhiban will aid in uncovering just exactly how local communities managed to make ends meet. Although these aren’t my only interests in the field of archaeology (the study of languages is an important part of my research) there’s only so much you can do in one season! I typically wake up every day around 4 or 4:30 am. If my roommate’s alarm doesn’t wake me up, the call of the muezzin (the individual who makes the Islamic call to prayer) will. After shuffling my largely unconscious body through the process of brushing my teeth and getting ready, I put on my excavation clothes and head out to our team lab. From the lab I gather my materials for the day, which include notebooks, artifact cards, the daily top plan of my square, and other odds and ends. The tell which are excavating is only a short walk from the lab, and I am usually there working at about 5:15 or 5:10 am. Despite the fact that outside of excavations I have trouble waking up at 9am, this is a great time to be out as the sunrise over the tell is breathtaking and the air is cool. With the aid of Karl Toomet, I then begin drawing and excavating. Our square is pretty exciting as we have what seems to be a Mamluk era building with some potential Byzantine and Iron Age layers. This usually continues on until 8:30 am, at which point we head off the tell for breakfast. After a usual rowdy breakfast, most of the team heads back to the tell to continue working until about 1:00 PM. Depending on the workload, however, I head back to the lab to start the analysis of dirt samples known as flotation. Flotation is an archaeological technique that allows archaeologists to recover carbonized remains. It seems rather odd to be chasing after burnt trash, but I like to think of it in terms of the American show CSI. In CSI, crime scene investigators are able to piece intricate stories using scientific analyses of small traces of rubbish. Maybe it only helps me sleep better at night, but the recovery of these remains allows me to do the same things, except for the reconstruction of past cultures often thousands of years old. In the days to come I will probably explain flotation a bit more. After either floting or excavating, we then head to lunch at 1:00 PM. After lunch, we have free time until 4:00 PM. Many people go home and take a nap, relax, or have some tea. Rather than that, I usually work out for about 45 minutes much to the amusement of the rest of my team members. I then shower, and head back to the lab around 4:00 PM to finish either floting or any remaining paperwork that needs to be addressed. If the situation calls, I may also process artifacts like pottery. We do this until about 6:00 PM at which point we have dinner. Then around 7:00 PM we usually have a lecture to attend. Finally, at around 8:30 we are done for the day. No one can say that archaeologists don’t work! I am usually in bed around 10:30 PM for another day. This is my final week at the ’09 Dhiban Excavation Project. It’s been a great experience, and I’m sorry to have to abandon ship mid-journey. I’ve learned a lot about archaeology, Jordan, and limited-water-hygiene. I’m grateful that the directors and experienced crew members have been so willing to help teach me the ins and outs of excavation. I have participated in two previous field experiences but the first one was light on the archaeological education and the second was hardly a proper dig at all. Additionally, as a history major and anthropology minor, I have spent lots of class time working with published archaeological evidence, but little time studying actual field methodology. The Dhiban project has been a great place to learn proper field techniques because of its integration of many different types of field procedures, and the fact that the undergraduates change “field roles” weekly. In my four weeks on the project, I’ve been able to get hands-on experience with site-grid setup using a total station, surveying and data collection (in order to select sounding areas), archaeological floatation, and geology. This is, of course, in addition to digging in the trenches, which I’ve been able to help out with as well. I have gained valuable knowledge about the processes that are involved in selecting sites, setting up sites for excavation, and the various ways in which myriad forms of data are collected and brought together to study the past. I look forward to seeing how the project develops and will miss my new friends, teachers, and the Tell in the days to come. 2. Toilet seats you can sit upon. 3. Something more akin to gender equality. 4. Going out without the nigh necessity of male accompaniment. 6. Drinking water from the tap. 8. No dust to make my camera/other electronics/contacts cranky. 9. No concrete homes with random rebar haphazardly sticking about. 11. Being able to let the shower water run on your skin. 12. Condiments. Ketchup. Mustard. Miracle whip. 13. More trees/plant life. I miss shady maples. 14. Ice cubes that are completely safe. 1. Manners in the area of overwhelming hospitality. Often if you walk into a shop and make conversation with the owner, in about 20 minutes you’ll be sitting down, having tea and biscuits with him/her. Jordanians hardly ever get to their intended destinations in a timely manner as they are constantly being invited to tea while walking down the street. 2. The wonderful fact that you can spill water here and not concern yourself with wasting paper towels or just time/effort to clean it up. When you return in 20-30 minutes, the water will have evaporated completely. 3. Mold literally cannot live here. Not in Sarah’s soap container, and not in my dirty/wet clothes that I sometimes leave in piles. 4. Sunsets/Sunrises. Jordanian sunsets over are just beyond beautiful. Sorry Midwest, Jordan has trumped you in this department. 5. The bee/wasp population in Jordan is significantly less than that in America. This pleases Alan and myself. 7. Jordanian desserts (delicious!) and the strange, flat, sort of pita-like bread we purchase fresh and eat daily. 8. Beautiful archaeology. Beautiful mosaics, beautiful art. A rich history that spans centuries and resides alongside the modern. Refreshingly different from home. I have been overwhelmed by the hospitality I have experienced. While shopping in Madaba twice after chatting and looking for a while with the shopkeeper my group and I were presented with small tokens of Jordan (tiny olive wood crosses and small Jordanian flags). We were also offered tea and seats in one shop. I am not particularly naive and these were the shops in which we spent the longest time and spent the most (mostly my companions, I plan to spread my souvenir purchases out over my stay here especially considering we have a number of weekend trips planed to the high points of Jordanian Archaeology, but I digress). Indeed more than one shop keeper mentioned tourists were few and far between this time of year. However, I think the hospitality went beyond trying to secure a sale. At all times I felt that the shop keepers were equally friendly when we didn’t buy something. Upon arriving home I mentioned this to the directors and they said that the Jordanians were quite proud of their reputation as one of the most hospitable people. And I can see that. Further examples on Jordanian hospitality spring to mind. On Thursday the girls on the excavation were invited to the wedding celebration of the sister in-law of the Jordanian liaison and translator on the dig. Even though we were strangers, who spoke very little Arabic, the women, who spoke very little English, made every effort to make us feel welcome and to make conversation with us. Even walking in Dhiban we have been invited into total strangers’ houses to take tea. Sorry about the delay with the last post. There were a few difficulties to overcome before the internet could be reached. This past weekend we took an educational field trip to Jerash and several other sites. The reconstructed Jerash was wonderful. It was my first experience with a classical temple. Wait I tell a lie…I saw the Pantheon, which while awesome is not quite typical so I amend my statement it was my first standard temple (ie big steps, alter area, rectangular, big pillars etc.) Anyway, having studied Rome and Greece I had a vague idea how monument the temples were supposed to be, but I had never considered that they would be so huge. The temple of Artimus was completely massive the entrance started 100 m to the right of the cardo road, continued for another 100m plus up a massive reconstructed staircase, up to the alter with its well and then in to the temple proper with place for the cult statue in the far back. Even though much of the decoration, statues, walls and roof was missing it was impossible to not feel overwhelmed with the majesty a deity is supposed to inspire. It felt very much like I was walking into on of the great cathedrals of Europe. Also the scale inspired awe was augmented by the realization that this site was two thousand (at least) years old and that I was standing where the ancient Romans had stood (and a lot of other people too, but I’ll admit I have a thing for the Romans so I tend to think of them first). I’ll admit one of my favorite things to do at a site like that is to imagine that I am a Roman striding along the streets, visiting the nymphaeum (monument to important ie wealthy people), the theater, the baths etc. Of course then my practical side kicks in and I remind myself that I am currently walking in the street and that if I was doing that in Roman times I would be ankle deep (or deeper) in muck, everything would smell, and that I probably would be a slave, being of Eastern European origins. On a lighter note, the reconstructed theater is pretty nifty as well and I saw something there I never expected to see in Jordan; a two man bagpiper and drum band. They were playing in the orchestra of the theater and when I entered there was a group of young men doing Middle Eastern style dancing to the music. The other sites were well worth the visit as well, the ovoid agora, cardo (main street) with standing pillars, temple of Zeus (which we couldn’t go into because it was under construction), the hippodrome (sports area), Arch of Hadrian and churches with mosaic floors. The mosaics are really quite beautiful and it is quite tragic that some of them had their human figures replaced with plain white tessera during the iconoclasm debate (ie the debate in Christianity over whether it was ok to make human images or not. By the way I apologize for those of you who find my explanations unnecessary. You see I’m not sure who is reading and I want to make sure most things are accessible to everyone). So that was just the briefest taste of Jerash and I am afraid I will not be able to write about the rest of the sites because of time but let me write a brief note on driving in Jordan. As one of our team observed, unlike driving in the US, Jordanian driving is organic. Lanes are only suggestions, if there is space between two cars you obviously should put your car there. Passing should be done when ever necessary not just when road conditions allow clear vision ahead. And you should go at the speed that is right for you. I have also seen entire Jordanian families (father, mother and 5 children in one small car. The cars are everything from old VW bugs to shinny new hummers. And even though it seems to be mass chaos most of the time I have only seen one accident. It really is quite remarkable. Well break is over and its time to wash another round of pottery. Take care all. Excavation is well under way here at Tel Dhiban. One of my favorite things about this trip is seeing the sunrise over the Tel in the early morning. The Jordanian landscape is surprisingly beautiful! Last week I excavated in the interior of a room of a Mamluk house, looking for some sort of living surface through roof collapse. Meanwhile, we found two fire installations and a large bin against the wall. There was a possible partially preserved living surface we found on the east side of the room. One exciting find I found in the sift was a small stone spindle whorl which someone once used for sewing. This week I was rotated to a trench that was started from scratch this season on the hill above Mesha’s palace. We are still currently digging in the Islamic period and making our way down eventually to the Iron Age, where we will hopefully find some interesting things. My unofficial job here is now the pottery labeler. It’s quite tedious work, but some music on makes the job go faster. Unfortunately, it is rather hard to dance and write in miniscule letters at the same time. The weekend trips are a great break from the hard work we do here. We went to Jerash last weekend and a couple friends and I spent a good hour or so sitting on top of the Temple of Artemis enjoying the view. It was absolutely gorgeous! I also saw some Roman theaters both at Jerash and Umm Queis. Sitting in ancient theaters is one of my favorite feelings, so it was nice to experience that so many times in a row. The scaenae frons of Roman theaters are also much better preserved than Greek ones since the Romans made them out of stone, so it was amazing to see the actual stages. One theater at Umm Queis was in the process of being excavated, and the cavea (seating area) was still covered, but you could see the curve in the hill and the archways supporting the seats poking out. It was really interesting!